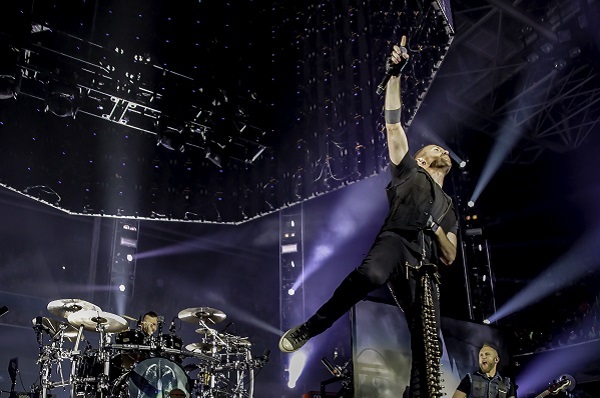 Thousand Foot Krutch rocked the Winter Jam tour last year, and it’s an experience they wanted to capture forever. Now, footage from their Winter Jam sets will be released as a new, live concert album, “Untraveled Roads,” which is out on Sept. 15. Frontman Trevor McNevan couldn’t be happier with “Untraveled Roads.” He chatted with Anne about the live set, the importance of a solid rock concert to Thousand Foot Krutch and how the band’s faith plays into not only band members’ music but lifestyles. Follow along with the interview below, and listen via the YouTube player. Find Thousand Foot Krutch online at ThousandFootKrutch.com. Pre-order the new album via iTunes here. Congratulations on the live set, “Untraveled Roads.” This features footage of Thousand Foot Krutch on last year’s Winter Jam tour. What made this the right tour to share? We got out there to tour on the “Exhale” album, and this was such an awesome tour. You get connect with people, and these shows had such a great energy. It made us think that we hadn’t really captured that live moment since 2010’s “Live at the Masquerade.” That’s what inspired the idea for “Untraveled Roads.” It’s a really special thing, and I’m excited about how it came together. Thousand Foot Krutch is known for having a high-energy live show. How important is the live concert experience to you guys? It’s very important to us to have real fingers on real guitars and real voices on real microphones. It’s such a special connection we feel when we get to share our music with the audience and connect with their stories and share the energy. The power of music is a really beautiful thing. As a vocalist, it’s always been a big deal to get up there and connect with people face to face. There’s nothing that can replace that. I think you can hear that on this record. How does your faith influence your life and music? It impacts my life every day. My heart has always been to make music for everyone, and to us, our faith is our lifestyle, and we don’t look at it as a genre of music or group of people. We make music for everyone, and we love God. People ask, “How do you balance everything between work and touring and writing and family?” A big part for me has been relying on God’s strength. We’re all imperfect. It helps to have a great wife and a couple of beautiful kids, too! I would say the new Papa Roach record is sick. If you like that band, I think it might be their best record. They’re one of the bands we came up with in the scene. My buddy Manifest has a new rock record out, and I got to be part of the songwriting, and it was really fun. Outside of that, I actually listen to a lot of hip-hop. I came up on hip-hop. If it’s a good song, it’s a good song, whether it’s Jay-Z or Metallica.